For many different reasons, many people have feelings and suicidal thoughts all over the world. You’re not alone in this fight against those feelings and thoughts. 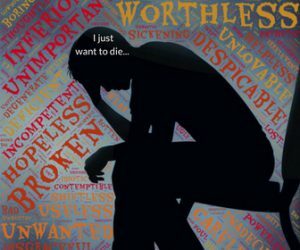 What every person with suicidal thoughts have in common is that they feel overwhelmed, hopeless and confused about what is about to come into their lives because don’t find meaning in it. This is how depression works; it makes you feel like your feelings are too much to handle, everything seems too big of a problem, every situation seems worst than what actually it is. You’re not crazy for thinking like this, you just have a lot of depression. Keeping things simple, (like I love to do) suicidal thoughts are triggered by an overwhelming feeling of stress mixed with depression. – Legal Problems: Dealing with something legal like a divorce or deportation for whatever reason is a lot of stress to manage. A lot of people can’t feel like there’s another solution instead of taking their lives. – Sexual Identity: I know this is a personal ground of each one of us, but reality tells me that having a confusion about your sexuality can lead you to depression and lastly suicide. For further proof, you may know that there’s a 40% suicidal rate among transgender people, a lot higher than non-transgender people. – Financial Problems: An overwhelming debt and not knowing where to get the resources to pay it is one of the common reasons why people commit suicide and succeed. – Health Problems: Dealing with cancer, chronic pain, diabetes, or any kind of medical condition it’s stressful too. What’s even worse is that some medications can actually make feelings of depression worse. Talk to your doctor if you feel any medication makes you feel depressed. – Mental Problems: Or what I consider “emotional problems” like depression and anxiety can worsen your feelings, leading you to have suicidal thoughts more frequently. – Loss: Social status, a job, a breakup, the loss of a loved one by death, or any kind of loss, make us feel sad and thinking about how we’re going to deal with this life without it. For some people, there’s a lot of pain and grief to deal with, and start having suicidal thoughts. Instead of trying to escape everything and evade this difficulty, you need to look at the facts and realize that life, itself, is an ongoing mastery of difficulties and overcoming of obstacles. I mean, everybody has difficulties and problems to solve in their own lives but by seeing things with the “depression lens” you think that everything is worse, first step to stop having these feelings is by communicating with others about them. Everyday in everyway I'm getting better and better"
If you feel a lot depressed at any given moment then start writing this statement and fill an entire sheet with it. Afterward, check how you’re feeling again, I bet you feel a lot better. Grab another sheet of paper and start writing all the reasons for being alive, if it’s too hard to think of a lot of them, then at least just right 10. When you finish call a friend or someone you trust and read them your new list. You’ll be surprised at how well this technique works!! There’s also common sense that if you take care of yourself you’ll feel better about yourself. You know that common knowledge like don’t use alcohol or drugs, have a healthy diet, do some exercise every day and do things that you enjoy doing even if you feel like not doing it at all. Well, If you’re thinking about killing yourself or know someone with this kind of thoughts I hope that this post can help to stop depression and suicidal thoughts. There are a lot of options out there and all of them are better than taking your life! Remember you’re not fighting this fight alone!